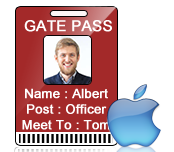 Download Visitors ID Cards Maker for Mac design visitor ID card and Gate Pass for visitors on Mac machine using various pre-defined templates. Software provides option to add visitor's details to the database. You can also export your visitor's record in Excel.